Donna Caubarreaux: Unconditionally is finally alive! Lew Hunter, author of Screenwriting 434 read it and wrote 'Wow!' on the cover after he read it. Award winning? Yes. In RWA's Screenwriting Chapter, Scriptscene. If you've never read a screenplay before it's a different experience. It helps if you're a visual person when you read one. 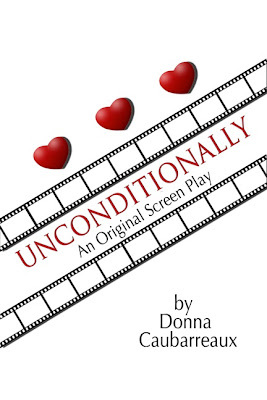 It's a drama about unconditional love...there are some tender moments in there where the character's react to what is happening in their lives. Trying to convert it to the different formatting venues was a challenge. Happily, Zoe Winters gave much shorter and simpler directions to convert to Amazon than anyone else. If you want to epublish get her book, "Smart Self-Publishing" available on Kindle. I have it on my hand-held Kindle, but also downloaded the free PC Kindle so I could look at each page individually. You can get a free copy here until May 17th. The coupon code is ZZ87T. Enjoy! And if you like it, how about a review? So cool! I didn't know RWA had a screenwriting chapter. Good luck!